Earlier in the week, some surface high pressure control influenced local weather, coming from the south-west. Whereas the cloud base was around 22,000 feet, this quickly turned around as the high pressure influence dissipated, coming down to a very promising 11,000 feet by Friday. The high pressure source, the South Atlantic high, followed its customary summer trajectory from west to east around Cape Agulhas, confirming the positive signal of last week that the high’s core straddled the 40°S latitude. (Circled in the visual in lilac). Equally encouraging is that the next core, still some four to five days away, is somewhat weaker at 1020 mB and that it also sits across 40°S. From a fortnight ago, the South Atlantic high pressure cell has rapidly shifted to the south and in both of the last two passes, the outer rim at 1016 mB stayed mostly offshore allowing summer dynamics to lower the barometric pressure over the southern African interior. This week’s visual is the daily South African synoptic map of surface conditions as they were on Thursday morning 00:00. It is a highly complex synoptic pattern with visible linkages between offshore and onland conditions from south to north, and just as much zonal complexity from east to west. 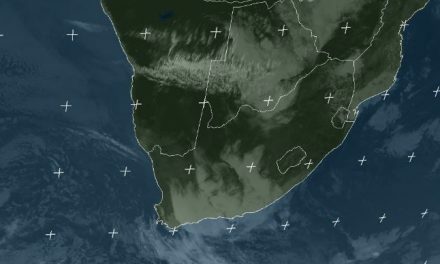 The two tropical storms east of Madagascar have taken their toll on moisture in East Africa, but with a positive impact in the lower latitudes, specifically southern Mozambique and Zambia, which both lay in the pathway of the moisture that eventually enters Namibia’s airspace and brings us clouds. What is not so readily visible on the visual but shows up very clearly on satellite images, is the observation that the band of lower pressure between the high over the Kaokoland and the high in the east of the subregion, actually consists of two distinct layers of activity. The lower, closer to the surface, circulates air with less moisture from southern Angola into northern Namibia, while the second system, about 15,000 feet higher up, is the result of a strong cyclonic circulation (lower pressure) in the middle layers of the atmosphere. This was the driver of the moisture that penetrated deep into the eastern half of Namibia and southern Botswana, and from there curved back into Namibia bringing much cloudiness and local falls over large areas in the Karas and Hardap regions right up to the escarpment. At the southern end of this band of lower pressure, a more pronounced low pressure system started developing around Thursday. This was in the wake of the South Atlantic high which has migrated to the east by then, creating space for a fairly extensive system to develop over the Northern Cape. In addition to advecting moisture into Namibia’s southern regions, the low pressure system amplified the band of lower pressure with the result that ample moisture (above 45%) entered the Namibian interior, resulting also in widespread, but somewhat isolated falls over the central high ground. Lower pressures over the Namibian interior remain in place for the duration of the weekend. The strong low pressure system over the Northern Cape, however, quickly dissipates ahead of the next approaching South Atlantic high, shifting the entire system further east. 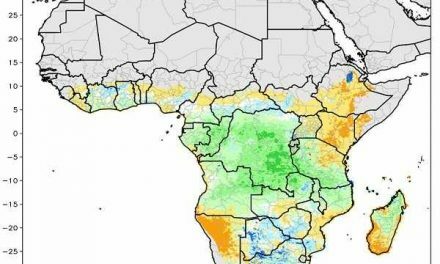 As a result, rainfall prospects remain positive for the whole length of Namibia but not in the central west and over the Namib. The clouds will however reach to the escarpment but with much lower density in the west compared to the east. Temperatures over the whole country will moderate, also in the north-western corner of Kunene. 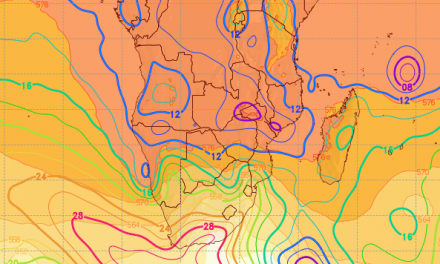 By Monday, the overall pattern reverts to a more familiar summer pattern with a very hot interior centred over the Kalahari, and intermittent cloud formations running from north to south. Rainfall prospects diminish fast on Tuesday and Wednesday with only Ohangwena, Kavango, eastern Otjozondjupa, Omaheke and eastern Hardap given any chance of rain. From around Wednesday, surface conditions will again be under high pressure control, covering two thirds of Namibia (from the south west) with only Bwabwata and Caprivi due for some scattered falls and a small chance of rain along the Botswana border up to about Buitepos.